I know what readers are asking themselves – namely, what business do I have in commenting on the reality of the times while critiquing a film in which those problems are glossed over for the sake of cheap sensations? If I am obliged to stand on a soapbox, it’s because our fears are molded by the world rather than the movies, which are only charged with the task of confronting them. We go to these sorts of endeavors invariably to have a strong reaction – not necessarily in relation to violence but perhaps to absorb something about human psychology as it is tested in violent scenarios. There is a dialogue exchange in the early scenes of “Election Year” where a deli owner argues with his employee over the likelihood of a an anti-Purge candidate being elected President, and as his words came rushing off the screen I sensed an eerie commonality of the police shootings; it’s as if they could have been used to attest to the legal plight of minorities in most circumstances, not just those of a violent fantasy. That DeMonaco thought about this implication as he made all of these films may not have given rise to perfect endeavors, but their ideas are audacious and challenging when so few (especially in this genre) have been willing to walk a relevant mile. Here is a filmmaker whose will be formidable when his skill grows to match the vision. “Election Year” is an exaggeration built on that premise, a third venture through the lurid illusion of a political nightmare in which a power known as the New Founding Fathers have allowed society to embrace their dark nature once a year, when all crime (including murder) is legalized for 12 straight hours. The economic benefits offer intriguing insights: peripheral crime has dropped immensely, poverty is nonexistent and the nation’s financial health has blossomed beyond projection. By most measures, it is the poster image of a thriving democracy. But the story’s point is to dig behind that revelation and discover the underlying intentions of the NFFA, which are hardly a mere embrace of anarchy: they know that citizens with money will be the ones that are able to buy their safety, and those less privileged are likely to be wiped out during Purge night. Each film thus far has dealt with a specific facet of this argument down to the inevitable uprisings of the oppressed, and now it leads to this, a finale in which a prominent voice of dissent is put in a political position that could derail the momentum of this bloody movement. She is Charlie Roan (Elizabeth Mitchell), a senator who once survived a Purge night while her entire family was slaughtered before her eyes. That tragedy adds fuel to her political flames as she positions herself for a presidential bid, and the movie’s early scenes show her in solidarity with an angered middle class as she dismantles the arguments of government superiors that still support the Purge. Unfortunately, that also opens the door for vindictive plots from those high above, who prattle on in a closed conference room about the “threat” to their nation and change the rules of the upcoming murder night to include all levels of government agents (previously granted immunity). That is not as much of a concern to Senator Roan as it is to her security team, including her bodyguard Leo Barnes (Frank Grillo, the lone carry-over from the last film); despite all she has been through she still maintains some level of optimism for the endurance of good gestures, and she plans to ride out Purge night in the comforts of her home rather than in lockdown at some government building. The chaos of the night spills over. Key figures within her security team turn out to be disloyal, and there is an ambush that forces she and Leo onto the streets of Washington D.C., where the residents are engaging in open warfare. The plot requires them to connect with a group of survivors attempting to stay alive for the sake of adding support to the cause, and the minor players are certainly some of the most well-drawn yet: Joe (Mykelti Williamson), a deli owner who uses sarcasm to cloak his hardened edge, Marcos (Joseph Julian Soria), his young employee who is just as sharp with his aim as he is with his moral observations, and Laney (Betty Gabriel), a triage van driver whose kindness is easily turned off when others become a nuisance. In a constant endeavor to save the Senator’s life, the group seeks refuge in an underground safe hold run by Dante Bishop (Edwin Hodge), the leader of a well-known resistance against the NFFA, who has his own agenda in motion: the assassination of a key figure in the presidential fight at a nearby church. But is that a wise idea when Roan is close to actually positioning herself for a win? What if his death would lead to Purge supporters seeing him as a martyr? The arguments swirl in a climax that sees both plots converge in rather bloody shootout between factions, and DeMonaco’s point remains singular: violence solves nothing other than inflaming the cycle that is destined to consume us, but an idea can live on if enough people see it as a viable solution against the corruption. Of course this doesn’t necessarily suggest that “The Purge: Election Year” is all that effective as a standalone movie, either. Ideas aside, the picture follows an almost identical narrative arc to its predecessor, suggesting that the direction lacked the foresight to go as far as its theme suggested; most of the scenes involve the same setups, the same sorts of ambushes and the same elaborate shootouts that structured the prior endeavor, usually too brief to get beyond initial shock factor. The difference, perhaps, comes down to the depth of the characterizations. Many of the supporting players in “Anarchy” were just gigantic targets of flesh, whereas these ones are distinctive, likable and have an active stake in the plot’s intentions. 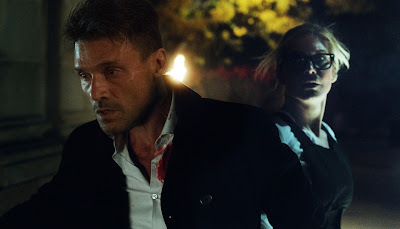 I also admired how Frank Grillo was able to reinvent his character – an ominous renegade – into the image of a stern but loyal defender; it fits the trajectory of his personality after what went down in the last movie. Will fans of the series feel that is enough to justify the end result? It’s hard to say. Many more admired “Anarchy” than I did, and my feeling that the first film is the best is not exactly in sync with the general consensus. If there is anything to be said that is universal of these films, it’s that they represent the thumbprint of a filmmaker who is inspired enough by the injustice of the world around him to see it as a viable laboratory for film observation. While the results don’t always resonate deeply, there is a valid reason they were made, and that’s admirable when ideas are usually lost behind the crude visualization of blood and gore.